I was born in Copley, Ohio, September 26, 1934. Born at home, which was a very old farmhouse dating back to about the 1840-1850 period. It hadn’t been painted in years, so it was a dark natural wood color — sort of a dirty grey. We had no electricity or indoor plumbing. The house was quite large. At least it had quite a few rooms, probably not as large as it seemed as a child, but about 12 rooms I think. The house was my grandfather Wagar’s, and we lived there with them. My father was Daniel Ammon Hufford, and my mother was Ruth Elizabeth (Wagar) Hufford. I had one sister (older by 4 years and 8 months) named Esther Mae. My mother was born 1895, and my father 1897. My grandfather Wagar was a naturalized citizen, having been born in Canada. The farm was 50 acres, 44 of which was ours, and 6 which my grandfather had sold, but we continued to farm it, since the owner did not have any immediate use for it, except a hedgerow of grape vines. We did have water piped from a spring on a hill behind the house, into a spring house, and then into a barrel in the cellar (not what we now think of as a basement – it had bare earth floor, and the walls were made up of very large stones, cut into blocks) which was directly beneath the kitchen, and we pumped water from it with a “pitcher pump” on the kitchen sink. We had an old fashioned icebox, and every few days the iceman would deliver a large block of ice. I remember when my father and grandfather installed wiring to the house (I was 4), and we could get electric lights, and a refrigerator. We still used an old fashioned coal stove in the kitchen, but also had a small kerosene stove, which, I think, was used for canning and cooking vegetables. We got our hot water from a tank attached to the coal stove, called a reservoir. On the farm we raised corn, wheat, oats, and hay. My grandfather also had 14 Holstein dairy cattle, and all were milked by hand twice a day, and so we seldom traveled far. The dairy barn was a long low barn, which made an “L” with the big barn, where the grain, hay and some equipment were stored. Also the horses (a team of work horses) had their stable at one end. Behind the barns was the front pasture, where the cows first went when they left the barn. Along the South line of the farm was a fenced lane which went all the way to the back end of the property, where we had another larger pasture. The cows would walk back there every morning during warm weather and come “home” every evening on their own. One vivid memory I have is seeing the cows let out for the first time in the spring, after a long winter. They would jump and leap around the pasture in joy. On the other end of the barn was a corn crib. My grandfather used to cut and husk all of the corn by hand. My dad helped when he could, but he had some other part time jobs, such as school bus driver and painting and wall-papering. I also remember going out with my grandfather and helping husk corn. Those were depression days and money was scarce. The first car I remember was a 1929 Chevy. Once when it broke down, I remember my dad came home with a loaner, which was an old coupe, with a rumble seat — I begged him to keep that one. (Thought the rumble seat was great — never thought about rain and snow.) Later we got a 1930 Chevy, which we kept for a good number of years. We also had a model T truck – never driven much, but I do remember going to a coal mine to buy and haul home coal that we needed. The horses were used mostly on the farm, but we did have an old Fordson tractor (1921 model I think) with steel cleated wheels which my dad would use for plowing, pulling tree stumps and other real heavy work. I learned to drive the tractor when I was about 7-8 years old. I had to stand on the clutch to push it in, which worked on the tractor, since it was designed to be pushed down. Some of the little things I remember are standing at the entrance of our driveway, which was fairly long, when it was time for my dad to get home from his bus route with the bus, which he parked by the barn. He would stop and let me on and I would ride back to the barn and while he turned it around to park it; that was a big deal. I remember the first time I got to eat dinner with the thrashers, instead of eating in the kitchen with the women. I’ll explain: We cut our wheat with a binder, which tied the wheat stalks into bundles, which we brought into the barn and stored. When we had it all cut and stored, a fellow who owned a threshing machine would come. The neighboring farmers would come to help, and it would take most of a day to thresh all the wheat and oats. The threshing machine was pushed up into the barn, with the blower-spout sticking out the other side, overlooking the front pasture. A tractor with a belt-drive parked outside the barn and a belt drove the machine, which was very noisy with all the threshing mechanism operating. A man sat on top of the thresher and guided the straw blower (a long pipe-like duct which extended some 30 feet out from the barn) and made a large straw stack, where we got straw for stable bedding all year long. It took skill to spread the straw properly for a good even straw stack. I thought the man running the blower was really great. At noon, dinner was served to all the help — lots of chicken, mashed potatoes and gravy, biscuits, and vegetables, with pies for dessert. I thought I had grown up when I got to eat with the men. Of course, we went and helped the others thresh too. I remember when we brought in the hay. We didn’t have a baler, but used a hay loader behind the wagon, which picked up the loose hay and dropped it in the wagon, where we, with pitchforks, spread it around until the wagon was piled high. The wagon had steel wheels; when empty, it was a very bouncy ride, but sitting on top of all that hay, I thought it was like riding on air. I remember walking behind my grandfather when he plowed with the horses, looking for arrowheads, of which we had a box full, and picking up worms. We also always had a large garden, which my grandfather would plow, but my mother and grandmother usually planted most of it. I learned to help there, too. They canned a lot from the garden, and of course all summer we ate fresh from it — lots of green beans, corn on the cob, carrots, beets, cabbage, tomatoes, lettuce, radishes, and some others we didn’t do every year. We had a number of fruit trees. We had 2 apple trees, a plum tree, a pie cherry tree (made such good pies), and a pear tree. My mom and grandmother canned a lot of fruit. We had chickens. When I was about two I had a pet (sort of) red hen- there is a picture of me with it somewhere, waiting by the back door. We ate lots of eggs, and sold some. The milk was picked up by the dairy every day, also. We had a milk house, with a big tank filled with cool spring water, where we stored the milk until the milkman got it, in the old-fashioned milk cans. We sold most of it. (We even ate margarine, so we could sell the cream.) We usually only killed and ate the chickens when they were old and had stopped laying eggs, so fried chicken was out (too tough!). My mother would boil them first for a long time to make them tender, then roll them in flour and brown the pieces in a skillet, so they seemed like fried chicken. When we butchered a cow, it was also because it was old, and not giving much milk, so most of the meat went into roasts and hamburger. We did have some round steak, pounded in flour to tenderize it; she called it swiss steak. I remember the first “real” steak I ever ate was in the Officers Club at Wright-Patterson AFB, near Dayton on an ROTC field trip in my junior year in college. It was about an inch-and-a-half thick and red inside, and I guess I still think that was the best steak I ever ate. At least that’s the way my memory sees it. Sometimes at home we got liver. I hated it but it wasn’t really a choice, so I learned to mix it with lots of potatoes, to somewhat mask the flavor. I have since learned to like liver and onions. I also used to think I would never want another white (or navy) bean. My mother would cook a big pot of beans. They were good the first serving, but after eating warmed over beans for three days, I didn’t much like them. By then they were mostly bean mush. My earliest church memories were going to the Wadsworth Nazarene Church (very vague). I remember going to Akron First Nazarene better. When the war began (WWII) and gasoline was rationed, we started going to a start-up church in a house in Copley, which then moved into our house, which was bigger. My folks donated a piece of land, and we started to build a basement church just a couple of hundred yards from the house. I drove the tractor while my dad guided the scoop, and my mother watched out the window, and prayed. I was almost 8 years old. That church became the Copley Nazarene Church, and I grew up in that church, and left when I entered the Air Force. It was still a basement church when I left. It no longer exists, as a Nazarene Church. A life changing event happened in 1943, when I was 8 years old. In late March, after a warm windy day, a tornado hit us about 9PM. I was in bed, and as the house shook, and windows broke, I slid under the bed. When things quieted down, I remember going downstairs and seeing my grandfather pushing the refrigerator against a door, which we didn’t use, where it normally was. The wind had blown the door open and moved the refrigerator. The house had a lot of broken windows, part of the roof was gone, and a wall had collapsed in my sister’s room. The barn had been destroyed and was a pile of timber. The horses were trapped, but unhurt. The cow barn had been lifted up, basically in one piece, and been dropped upside down on top of the straw stack. The cattle were left standing unhurt in their stations, which were set in concrete. Farms around us were badly damaged also — especially the barns. [Added by his sister: First my granddad had to walk up to the school – about 1/2 mile – to get my dad who was janitor and sitting in the dark as the power had gone out and he was not in the path of the storm so had no idea what had happened. Then the men had to get busy right away. First they had to find a young calf that had gotten loose and put it in the basement of the house. Then the men went to help neighbors who had to butcher cattle that had been killed or hurt badly. There was one room in the house with no broken windows; it was called our dining-sitting room, so we spent the night there. Also the clock had stopped when the tornado came — not an electric one but a mantle clock. It never worked after that. It said 9:15.] We went to stay with an aunt for a few days, as it was decided the damage was too great to the house to repair it and it was unsafe, which was proven when it was torn down, for it was on the verge of collapse. My dad was able to locate a house available right on the edge of Copley, about the nearest house in Copley to our farm, and in a matter of just a few days he arranged to buy it and move in April 1st. What a change from a 12-room house to a 5-room house, with only 2 bedrooms (one very small – about 7 feet by 9 feet) and still no bath. My parents took the bigger bedroom, and put a small bed on one side of the room for me; my sister took the small bedroom, and my grandparents slept in the dining room, in a curtained area, since we did use the dining room to eat in. I kept that arrangement for sleeping until I began high school, when my sister left for college. That house put us just 3 houses from the school, so I just walked (usually ran) to school. I could leave the house when the warning bell rang, and get to school on time. I also came home for lunch at noon. I got to listen to soap operas on the radio and eat fried bologna sandwiches most of the time for lunch. I still remember the names of the soap operas: “The Romance of Helen Trent” and “Our Gal Sunday.” The house next door was the Methodist parsonage where a girl just one year older lived, so we often played together, along with other kids from nearby. In the evenings, we would play hide and seek, kick the can, and other games. I do remember, I soon developed friendships with other boys my age farther away, and would go to play with them every evening after school. However I was always home in time to listen to “Jack Armstrong, the All American Boy,” “Terry and the Pirates,” and “Hop Harrigan” who was a pilot. All 12 years of schooling were in the same school (well, all but first grade, which was in the old building, which was later torn down). Elementary, Jr. High, and Sr. High school were all in the same building. Of the 50 in my class at graduation, 22 had been together since first grade. I got mostly good grades all through school — graduated 3rd in my class. In my senior year, there wasn’t a home room to accommodate the class, but no extra rooms to divide it, except the industrial arts shop, so about 10 of us used the shop for our home room. Things were pretty loose there — a couple minutes late didn’t matter much. My best friend through high school was Bob Cook. We rode sleds together, ice skated, swam together in the quarry (where we weren’t supposed to be), climbed the quarry walls (certainly very dangerous). After we moved from the farm, my grandfather was able to build a small stable for one cow [back on the farm property], which we kept there on the farm. Every day, twice a day my grandfather walked the 1/3 mile down and back to milk the cow. The chicken house we moved up to the back of our new property, so we had milk and eggs. All of our fruit trees had been destroyed at the farm. I was sorry about that. I went with my grandfather a lot, because he still always had a big garden there. (We didn’t have enough room for much garden where we were living.) The farm was mostly being farmed by a neighbor for shares, but we raised big gardens still. Eventually we got a walk-behind tractor. Later, about the time I started high school, we bought a new Farmall Cub. I got to start farming the farm some, because we bought enough equipment to plow, plant, and cultivate. We still had to hire someone to come and combine the wheat, which we sold. I also used the tractor for my transportation before I was old enough to get a driver’s license. I still remember hooking several sleds to the tractor, and going onto the back roads and playing crack the whip with the sleds, by zig-zagging the tractor. The last sled took a beating. About the time I graduated from High school we got a bigger tractor — a used Farmall C — which could pull a double plow, and bigger implements. I used that during college to help pay for school, which cost an unbelievable $90 a quarter. My senior year was a turning point in my life. I had planned on going away to Eastern Nazarene College, for a couple of years, and then transferring to Ohio State University agricultural school, where maybe I could get work as an agricultural agent and farm a little too. I met a girl named Kathleen, and suddenly felt a call for something else such as engineering. (University of Akron was an engineering school). Of course, I really didn’t know much about what an engineer did. I thought of it mostly as drafting blueprints and such, and I was good at that, based on my industrial arts drafting class. I didn’t know about the math requirements. I was accepted at Akron U contingent on going to summer school and getting at least a B in advanced Algebra, which I did. I entered college at Akron U the fall of 1952. [NOTE from his sister Esther: That is as far as he got before he was too tired and weak to go on with his story. He did not marry Kathleen, and he did transfer later to Kent State U. He got into the ROTC program and graduated as an officer in the Air Force.] 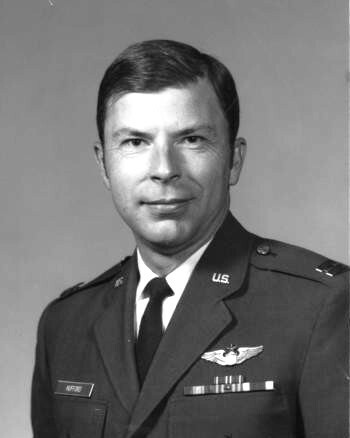 Lt. Col. Alvin Henry Hufford died August 26, 2006, in Maricopa County, Arizona. PAGE NOTE: Alvin Hufford’s father (Daniel A. Hufford) is listed with his father (Jacob Alvin Hufford) on page 240 of the 1909 HUFFORD FAMILY HISTORY. This entry was posted in Genealogy and tagged Christian > Philip > John Wesley by bethesdaalice. Bookmark the permalink. Good to see you back, Alice. Have you been to the Fairfield County, Ohio, Library? Never been there, Jan. I need to add it to my places to go.